Mother's Day is coming up fast on May 12, 2019! This is the day all moms want to feel special and appreciated. Plan ahead this year and find a perfect gift that will show Mom just how special she is to you. Here are some great ideas to help you find the perfect gift. All moms love to receive a bouquet of Fresh Flowers. Have us create an arrangement of her favorite flowers or choose from many great arrangements online at https://www.hillermannflorist.com/. From easy care succulents, to beautiful bloomers, to foliage of all types, there are many options of indoor plants that will remind mom of your thoughtfulness each time she sees them. Many types of Giftware and Décor for inside and outside are available to fit the personality of all moms. Moms love to dress up their, porch, patio and flower beds. Pick up her favorite plants and colors and help her create colorful accents in these areas. Find a perfect tree or shrub for Mom's yard or landscape beds. She will remember your thoughtfulness each time she sees your gift! There is sure to be something that Mom will love! Send mom wine and flowers or a wine gift basket to help her enjoy her down time. Visit us and check out our great selection of accessories and décor to find the gift that fits Mom perfectly. Let Mom pick out her gift with a Hillermann Gift Card. Since they are good in all our departments, Mom can find exactly what she wants! She can even apply the gift amount to Landscape Services or New Landscaping. Click here to order Hillermann Gift Cards online. Does your Mom like to watch the birds and wildlife? Browse our large bird and wildlife department for bird houses, feeders, seed, suet, birdbaths and more. Help bring more activity to Mom's yard and give her hours of enjoyment. If your Mom gardens, she may need some new tools to help her enjoy it even more. A great selection of gardening tools, fertilizers and more are available. Can't make it to the store to shop? Click here to check out the selection on our online store. Have a Happy Mother's Day from the Hillermann Team! Our Bicentennial Kite is Flying! Have you heard about Franklin County’s Bicentennial Celebration an the Kites Across the County Project? We are joining the celebration and our kite is flying above the heads of those who come through our Garden Center entrance! Come by and see! Visit these sites to learn more about Franklin County, the Bicentennial Celebration and the Kites Across the County Program. Join in the fun! Spring Is Unfolding at Hillermann's! Spring is unfolding more every day! Visit us often and watch the progress in the plants in our nursery and greenhouses. More selections of spring bedding flowers and vegetable plants arrive daily. More great trees, shrubs, and perennial plants fill up the nursery lot each day. What a great time to visit us and slow down to look at all the beauty that unfolds in spring! Plants and Items for SPRING! FRESH NEW SPRING PLANTS, ITEMS and DISPLAYS are ready NOW at Hillermann Nursery & Florist!! Check out the photo gallery below for a peek of what is here, then come on down for spring planting, decorating and gifting items. Let’s GET SPRING STARTED! Understanding exactly what you are applying and how it works will help you decide when to get out there and start your lawn care. First, it’s not a race. The first neighbor to unleash the spreader from the garage is not necessarily the winner, winner, chicken dinner. When you start looking at bags you will see words like ‘preventer’, ‘crabgrass’, and ‘pre-emergent’. The majority of first lawn applications contain a fertilizer (to make the grass grow) and what is called a pre-emergent herbicide. A herbicide is a chemical that kills plants (in contrast to an insecticide). A pre-emergent herbicide is one that stops a plant from growing. Look at the word: pre (before) –emergent (sprouting). HOW CAN AN HERBICIDE KILL A PLANT BEFORE IT IS EVEN GROWING? A pre-emergent kills the emerging seed of a plant either before or right after it sprouts. So, the weed killer in the first bag you put down is actually a weed PREVENTER. Weed preventers create a barrier where they are applied that blocks growth. But wait, you say. I have put this pre-emergent down before and I still had weeds in the summer. What gives? A pre-emergent will only stop weeds if they are sprouting from a seed. If the weed is sprouting from a root that stayed in the ground over the winter, a pre-emergent will not prevent it. This is common with weeds like dandelions, clover, and ground ivy. Weeds returning from established roots need a different weed killer. The #1 big battle of this category is crabgrass. Crabgrass doesn’t germinate until it’s warm. And I don’t mean the AIR temperature. Crabgrass germinates when the SOIL temperatures hit the mid 50s. And soil takes a lot longer to warm up in the spring than the air. Think of how long it takes a lake to warm up in the spring and summer. It may be a gorgeous day on the boat but if you jump in that water, you are in for a shock. Soil temperature is similar. It warms up very slowly in the spring. Crabgrass may germinate in late March in our area. Crabgrass preventers can last up to 4 months. We recommend another addition of prevention in late May to get us covered through our hot dry summers. There are several factors that influence the germination time of warm-season weeds like crabgrass. Every year is different, and every lawn is different. Did you know that we also offer pre-emergent service in our Hillermann lawn program?? So therefore, WE CAN DO IT FOR YOU. Stop in or call to let us help you with your specific needs. Graceful in flight, musical in its pre-dawn singing, this big swallow is one of our most popular birds. Martin housing has a long history: some Native American tribes reportedly hung up hollow gourds around their villages to attract these birds. Purple Martins migrate to South America for the winter, but before leaving, they may gather to roost in groups of thousands in late summer. Characteristics: Purple Martins are large, broad-chested swallows. They have stout, slightly hooked bills, short, forked tails, and long, tapered wings. Adult males are iridescent, dark blue-purple overall with brown-black wings and tail. Females and immature Martins are duller, with variable amounts of gray on the head and chest and a whitish lower belly. Purple Martins fly rapidly with a mix of flapping and gliding. They feed and roost in flocks, often mixed with other species of swallows. They often feed higher in the air than other swallows, which can make them tough to spot. Songs and Calls: Liquid gurgling warble. Also a penetrating tee-tee-tee. Diet: Insects. Feeds on a wide variety of flying insects, including many wasps and winged ants, and some bees; also many true bugs, mosquitoes, flies, (including house flies and crane flies), beetles, moths, butterflies and dragonflies. They also eat some spiders. Nesting: Males return to nesting areas first in spring to establish nesting territories. Natural sites are in cavities, such as old woodpecker holes, in trees. They usually nests in colonies, especially in east, where almost all nest in multiple-roomed nest boxes put up for them. At least 4 housing cavities should be offered and 6 to 12 is a great start to attract a colony. Aluminum, thick plastic, wood, and natural gourds are all suitable materials for martin housing, provided that the exterior of the house is white in color to reflects heat, keeping housing cooler in hot temperatures. Martins prefer housing that is placed in open areas with clear flyways. Choose the center of the largest open spot available, at least 40-60 feet from trees and within 100 yards of human housing. In the southern half of their breeding range, martins may accept housing that is placed within 25 feet of trees, but open areas are always best. Housing should be lowered, sometimes on a daily basis, to remove competitor nests and to monitor the nests. Therefore, it’s helpful if the housing is on a pole that has a telescoping, pulley, or winch system to raise and lower the unit. Recommended height is 12-18’. Note: Purple Martin numbers have declined seriously in parts of the west, and currently declining in the east. Reasons are not well known, but competition with other bird species for nest sites may be involved. on previous purchases. Print this page or mention offer at the checkout counter. The ZZ plant (Zamioculcas zamiifolia) gets its common name from its botanical name. Since Zamioculcas zamiifolia was long and difficult to say, many nursery workers simply shortened it to ZZ. The plant stems grow in a graceful, wand-like shape that starts thick and bulbous at the base and then tapers to a point. Along the stem are fleshy, oval-shaped leaves that make the plant look like stylized feathers. The entire plant has a waxy, shiny coating that makes it appear to resemble those made of plastic. Between the sculptural qualities of the plant and its waxy coating, it is not uncommon for people to insist that it must be an artificial plant. Small, insignificant flowers consisting of a spadix surrounded by a spathe may appear at the base of plants in summer, although ZZ plants rarely flower indoors. What makes ZZ plant such a good houseplant is that it's wonderfully tolerant to a wide range of conditions, including low light, low humidity, and periods of drought. It's truly one of the toughest houseplants around, making it a perfect choice to add to your home or office. In addition, it has air purifying qualities for the indoor environment. The ZZ plant will do best in bright to moderate, indirect light. While it can take direct light, you may see some scalding on the leaves if it is left in direct light. Additionally, curling leaves, yellowing and leaning can all be an indication of too much light. If you notice curling taking place, it typically means the plant is trying to move away from the light source. Move the plant to a shadier location or farther away from the light source. You can also try filtering the light with curtains or blinds if moving the plant is not feasible. The ZZ plant will also do fine in extremely low levels of light. This makes it an ideal plant for a window-less office or bathroom where it will only receive small amounts of fluorescent light. Water the plant once every one to two weeks - as the top inch or two of the potting mix dries. If the soil is wet or damp wait a little longer before watering. The plant has underground rhizomes that can rot if the soil stays too wet. As a survival technique, ZZ plant has evolved to start dropping its leaflets to conserve moisture during periods of severe drought. If you forget to water yours and see the leaflets fall, don't give up hope. Water your plant again and it should resuscitate. ZZ plants are happy without fertilizer, but if you would like, you can give the plants half strength fertilizer one to two times a year and only in the summer months. Pruning may be beneficial as the plant grows. Cut away leaflets that are turning yellow near the base of a stem. Once a stem has grown much longer than all other stems you can remove that stem or cut it to size at the tip. It can sometimes look a little odd when a stem is cut off to size, so removing it completely might be another option - depending on individual preference. Mini plants and mini gardens have become very popular. They have a cuteness factor that is hard to resist. Miniature plants can be used in a variety of ways. They work great in cute little containers, terrariums, and of course in miniature/fairy gardens. The joy of miniature gardening is combining crafting and gardening together to create a living masterpiece. There are so many options for creating mini gardens from fairy gardens to miniature landscape scenes. You can create a mini world containing plants and mini decor that reminds you of a favorite place or a place you'd like to be, or you can create a whimsical fantasy scene. The crafting part is attaining an idea, and then putting it into a mini garden. The gardening part is choosing the plants that suit your idea and will grow well together in the location you have available. The same golden rule applies here as in landscape areas - choose the right plant for the right place. The associates at Hillermann Nursery & Florist are here to help you with design, selection and care tips. Basics: The nuthatch is often described as the upside-down bird! This species often climbs upside down on tree trunks and branches. These birds have clean black, gray, and white markings. Song is a rapid series of low-pitched nasal sounds: “whe-whe-whe-whe-whe.” The call is nasal yank or “yank-yank” and is lower-pitched than the red-breasted nuthatch. They can be found in mature deciduous trees, in forests, woodlands, parks, and suburban areas. Housing: These birds typically nest in a natural tree cavity or in an old woodpecker hole, although they may use a birdhouse. Leaving some dead tree trunks in wooded areas can be helpful for nesting. 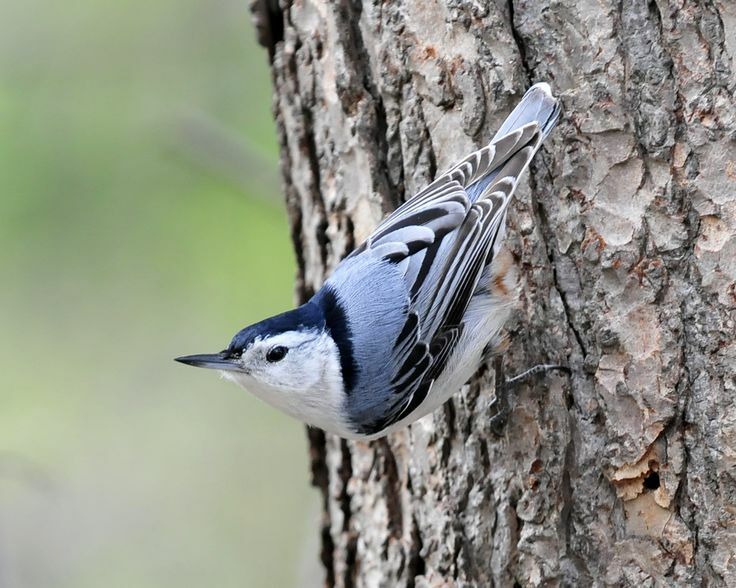 Food: In our backyards, Nuthatches will eat sunflower seeds, peanuts and peanut butter, and suet. How to attract: Offer the foods mentioned above, water, shelter and nesting sites. Fact: With a little patience, you can get nuthatches to eat from your hand. Let them get used to you by a feeder, then hold out your hand with sunflower seeds in it. Note: They can be quite aggressive at feeders. With wings spread, they will swing from side to side to keep other birds away.